There is no better place in the world to enjoy a cup of real English tea than in England. The thing about tea is that when it’s good, it’s very very good – heavenly actually – and when it’s bad, it’s horrid. And we don’t get very good tea in America. We get Lipton. And Lipton is horrid. I’m not talking about herbal tea. The U.S. has fabulous herbal teas, many even locally produced like Oakland’s very own Numi Tea, and I love me a cup of organic mint or chamomile tea after a meal as much as the next guy. But that’s not the tea I adore. My tea is real English breakfast tea, milk two sugars (although now I’m trying to eliminate sugar because I live in California where everyone is eliminating something from her diet and I had FOMO). So real English breakfast tea for me, with milk. And by real I mean not a U.S. brand. This is the Starbucks nation after all. I mean a brand from England. Or anywhere in the U.K. Or South Africa. Australia. I guess a brand from anywhere they play cricket. Because tea and cricket go together like Laverne and Shirley, Danny and Sandy, E.T. and Elliott (all of whom are American and would probably never drink tea, but rather double espressos. Sandy is Australian though – she definitely drinks tea). Tea makes my day. It starts my day. Often ends my day. Calms the chaos (all that caffeine) and enhances the calm (more caffeine). It has moved me through moments of terrible sadness and despair, and held me happier in the happy. Weekend afternoons are always about tea, whether rain or shine, soccer or swimming (no cricket in my very American family) because that’s how our parents do it in South Africa, and that’s how their parents did it too. One of my favorite memories is slurping tea from my grandmother’s saucer, like a cat. And last week I did get to enjoy tea in England. And it was delicious. 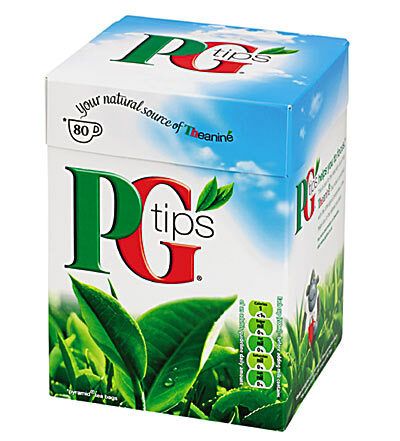 It wasn’t even a special brand – just regular PG Tips, but the English kind. And it tasted so much better. I didn’t pay attention to it while I was drinking copious cuppas in England. Rather, I noticed it when I came home. Because when I made a cup of tea on Saturday morning – real English tea – in my own kitchen, it tasted different. And it could’ve been because it was rainy and damp in London all week, or because the water tastes different over there (the big story last week was that traces of cocaine have been found in Britain’s drinking water), or that I was using brown sugar instead of white sugar (or no sugar). It could have been because of all those, or none of those or some of those. But it was definitely because of who I was drinking those cups of tea with in London. A friend so dear and special. A friend who has known me 35 of my 40 years. Who wanted to clear the slate on a little dispute we had in high school. Who loves “Mad Men” as much as I do and for all the same reasons, Don Draper being only one of them. Who remembers things I have forgotten and who can’t believe the things I have remembered. Who took me to see the fantastical cut-outs of Henri Matisse and then schlepped the banks of the Thames with me in search of tea and scones. We came up empty-handed – can you imagine? No traditional tea and scones on the south banks of the Thames?! We made tea for each other every single day, many times a day, during my week-long stay in London. We sat together at the beautifully distressed wooden table in her kitchen, while her slightly unruly English garden steps away on the other side of the glass door soaked up the gentle rain. She thought I made the best cup of tea, and I thought she did. Because a lot of love and decades of friendship, book reviews, gossip and chitchat, fashion do’s and don’ts and movie synopses, big decisions, hard conversations, silly stories, and so many tears and hysterical laughter and comfortable silences were poured into every cup of tea, made each one stronger, taste better, last longer. I missed her on Saturday morning when I drank my suddenly strange-tasting tea without her. And it may well be there is no better place than England to drink real English tea – or it may just be that I miss my forever friend. Because the thing about finally being together after a long time apart, about spending wonderful time with that special someone I haven’t seen for a while, is that I miss them more than ever after. And the tea tastes a little less satisfying… but only until next time. This entry was posted in Discovering Me, Exploring Friendships, I heart the 80s and tagged cricket, England, friends, friendship, Henri Matisse, London, Numi Tea, PG Tips, rain, tea, Thames by Nicki. Bookmark the permalink. Such a spectacular post, Nikki. How marvelous that you spent a week in London!!! I’m back from 3 weeks in South Africa and tea with my mom…I can so relate. Yes Terry that’s exactly it! Thank you for this lovely comment :). I made a cup of tea to enjoy while I read your lovely post… It turns out that tea drunk with virtual friends tastes pretty good too! I’m so glad you had such a lovely time in London. I shall be there in less than two weeks too… Can’t wait! hi you. hope you had a wonderful time spent w your friend. comoon core math – where do you stand? have been in the dark and just heard about this and the option to opt out. thoughts? xoxox. Thank you Lisa – such a lovely comment, and thank you for reading :). I don’t mind PG Tips but my absolute favorite is Fortnum & Mason! LOVE love LOVE that you were able to spend some time in England with your forever friend! I’d love to have a cup of tea with you in England. Or anywhere. Since I am new to your blog I was exploring and of course as a Tea Lover I had to read this one. I imagine London was beautiful! Tea and Friendship go hand in hand. They really do! I’m so glad you found this post – it’s one of my favorites.